Beech Mountain in Avery County is the eastern United States' highest town, at 5,606 feet above sea level. Local residents share the mountain with several resort communities and Ski Beech, a popular ski resort. During the 1970s Beech Mountain was also home to the Land of Oz, a theme park that has taken its place amid the rich folklore of the Appalachian Mountains. Throughout the early part of the twentieth century, Beech Mountain was part of an important logging industry. While sparsely populated, it was dotted with small cabins where loggers lived during the week while they worked. Skiing came to the mountain starting in the 1930s, with students from nearby Lees-McRae College using skis produced in the college's wood shop. The Robbins brothers-Grover, Harry, and Spencer-purchased a large tract of land on top of the mountain in 1962. The Robbinses, who also owned Tweetsie Railroad and the Hound Ears Resort, joined with other investors to create the Carolina Caribbean Corporation in 1965. Carolina Caribbean planned a 10,000-acre resort with homesites for 9,000 families, an eight-slope ski resort, a summer recreation area, a golf course, and a theme park. Grover Robbins enlisted Charlotte artist and designer Jack Pentes to develop an idea for a theme park that would draw people to the mountain during the off-season. Pentes dreamed of a place that would enchant people and allow them to escape the harsh realities of the late 1960s. For inspiration Pentes drew upon L. Frank Baum's classic children's tale of enchantment and escape, The Wizard of Oz, having noted the similarity between gnarled beech trees on the property and the talking apple trees in the story. With the help of two fellow Charlotteans, composer Loonis McGlohon and choreographer Alice Lamar, Pentes created the 16-acre Land of Oz theme park. When its first season ended in the fall of 1970, attendance had hit the six-figure mark. From hot air balloons and the magical cyclone to flying monkeys and happy songs, the Land of Oz allowed visitors to live every moment of the famous adventure for themselves as they walked the 55,000 bricks of the park's yellow brick road. Visitors were joined by each of the beloved characters as they visited Kansas, Munchkinland, the Wicked Witch's Castle, and the Emerald City. In 1975 the Carolina Caribbean Corporation went bankrupt. Shortly afterward, vandals set fire to the Emerald City and stole Judy Garland's original dress along with other artifacts from the park's Oz museum. The Land of Oz, already hit by a lack of repeat visitors, never recovered. As the property changed hands, the park fell victim to a lack of consistent management and poor funding, closing in 1980. The property was purchased in 1990 by the Emerald Mountain development corporation, which created homesites on 450 acres around the old theme park. Each fall, Emerald Mountain holds an Autumn at Oz party, where fans of the Land of Oz may take a nostalgic stroll down the yellow brick road and see remnants of the theme park that have been carefully preserved. Other artifacts from the park are on display at the Appalachian Cultural Museum in Boone. Beech Mountain was incorporated as a town in 1981. The mountain is home to a shopping village, the 14-slope Ski Beech ski resort, and two golf courses, including one designed by Jack Nicklaus. Robert R. Gottfried, The Impact of Recreational Communities on Land Prices in the Local Communities: The Case of Beech Mountain (1981). 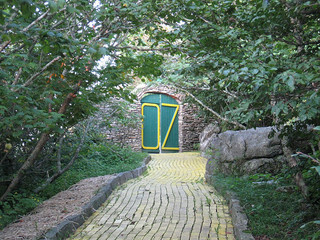 Door to the Land of Oz. Image courtesy of Flickr user _Rockinfree. Available from http://www.flickr.com/photos/rockinfree/2815633146/ (accessed July 6, 2012). 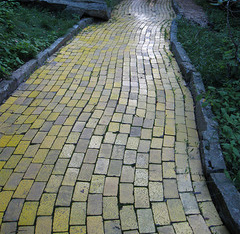 Yellow Brick Road, Land of Oz. Image courtesy of Flickr user _rockinfree. Available from http://www.flickr.com/photos/rockinfree/2814780379/ (accessed July 6, 2012). Do you know if there any known interviews with Grover/Robbins and/or Jack Pentes about the Land of Oz? And where could someone (like myself) potentially find such interviews? if I were to visit (drive up from Ft LAUDERDALE area) to visit anywhere in NC, as a beautiful spot, accessible to an int'l airport; and want to live in either a smaller town, not too small, but where I could walk most places to get healthy groceries, shop some, and yet still walk to restaurants; where would that be? A town home or a smaller 2/3 bedroom would please me. I also could be very happy on the ocean, in a safe enough spot, with great views. I also enjoy beautiful, small spots in a bustling city. My view here is of the ocean on t e 30th floor inHollywood, FL. It is a smaller town with a lot to offer; borders North Miami; therefore, it is within 30-40 minutes of all the entertainment that Miami has to offer. Thank you! I would like to leave this weekend. I am not fond of bugs or Mosquitos, however. Right now, I have spectacular ocean views in Hollywood. A Christ-based church is also very important to me. Thank you for visiting NCpedia and taking time to share your upcoming trip. Alas, we are unable to recommend the best places to live in North Carolina. However, I can share some resources that will give you an idea of the some of the more well-known places and both natural and man-made icons in the state. Check out this list of North Carolina's top "100 Icons", created by Our State magazine and with resources and links provided by the N.C. Government & Heritage Library. Visit the "Exploring North Carolina Places" pages on NCpedia. You will find articles and numerous links to information about the state's regions and geography as well as information and links to historic sites and other places throughout the state. I will be moving to North Carolina in July. I would love to take my kids to the Autumn at Oz Party. I would love some more info. about the dates of the party. Thanks for visiting NCpedia and taking a minute to ask your question. Unfortuantely, NCpedia doesn't have any additional information about this event. You might want to do a web search, or even contact the local chamber of commerce in Banner Elk (or the surrounding area) as well as the Beech Mountain Resort.